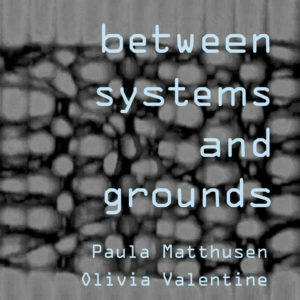 between systems and grounds is a collaboration between composer, Paula Matthusen and visual artist, Olivia Valentine. 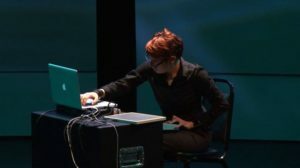 The work is a nomadic, durational performance and installation which combines the textile-based practice of bobbin lace with real-time, electronic sound processing. 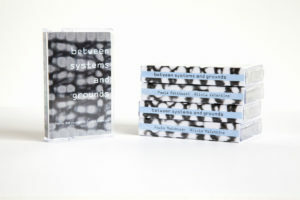 An album of real-time and time-compressed recordings of the project, released by Carrier Records, serves as a sonic archive of the broader work. Below is a review of the project. 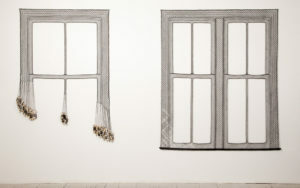 Olivia Valentine Guest Room at the Drake 2012, site-specific installation, string, nails, window casing, 72” x 111”. Hybridized of their discrete processes, between systems and grounds is a continuum. In its installation form, Matthusen and Valentine sit at work stations constructed out of white foam core furniture which is lightweight and can be easily assembled and disassembled. 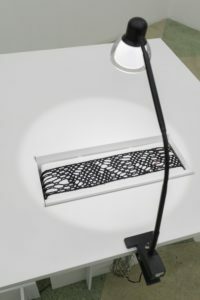 Spot lit by desk lamps and connected by lengths of black lace and audio cables, Valentine constructs bobbin lace which generates a data stream of micro-recordings. As her bobbins strike the work surface, Matthusen processes these signals through feedback and delay. As the system performs itself, the textile and sounds also multiply and shift. 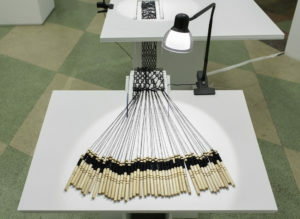 The textile itself can be played back as a “music box that slowly plays back accumulated recordings triggered by the textile.” The resulting system is an archive not only of this multiplying textile and the sonic feedback from its production, but also of resonant spaces—architectural, environmental, and geographical. Track listings are indexed by date, time, location, and indicate real-time or time-compressed durations as well as ambient sounds. For example, 1. I 07_12_16, 4_00 pm, Rabun Gap, GA (real-time [insects, summer breeze, bobbins, feedback]); 2. II 07_13_16, 11_17 am, Rabun Gap, GA (time-compressed [bobbins, feedback]). 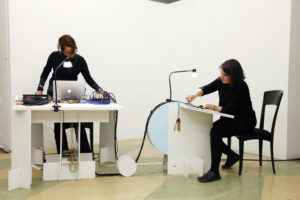 Matthusen and Valentine performing between systems and grounds. Sadie Plant in Zeros and Ones: Digital Women and the New Technoculture describes the relationship between textile process and structure, “Because there is no difference between the process of weaving and the woven design, cloths persist as records of the processes which fed into their production: how many women worked on them, the techniques they used, the skills they employed. The visible pattern is integral to the process which produced it; the program and the pattern are continuous.” The work is an example of what Gilles Deleuze and Felix Guattari describe in A Thousand Plateaus as the rhizome. Valentine’s lace making gestures deterritorialize by forming a sound while Matthusen’s process of electronic composition reterritorialize on those sounds mapping what the philosophers call a plane of consistency. “The map is open and connectable in all of its dimensions; it is detachable, reversible, susceptible to constant modification” One of the most important characteristics of the rhizome is that it always has multiple entryways. Structurally, lacemaking is a also a rhizomatic process because it can grow in all directions. The movement of the overarching project is nomadic in its spatial dynamism and potentialities to morph and shift its configurations and outputs. between systems and grounds musicbox 2017, part of the Hand/Eye exhibition. Carrier Records is releasing the album for digital download as well as in cassette format. I see this recording as an entrypoint for listeners to experience nomad thought. While it’s not the easy listening album you’ll put on during the holiday dinner, nor the booty-shaking heat you’ll drop at the next dance party, it is the ambient textural and sonic landscape of the studio and quiet solitary work. It calls awareness to how deeply we listen and what we hear when we listen closely. It promises to leave the residue of its velocities and intensities. Brian Massumi poses the questions in the foreword for A Thousand Plateaus: What new thoughts does it make it possible to think? What new emotions does it make it possible to feel? What new sensations and perceptions does it open in the body? In our current state of political and socio-economic turmoil, between systems and grounds might be a model for fluidity, a mapping of nomadic tendencies, or a portal towards other ways of sensing and knowing as we continue to do our quiet work. between systems and grounds musicbox 2017. —Jeanne Medina is an artist working between textile, fashion, and performance. She received her BFA in Fiber and Material Studies, Post-Baccalaureate in Fashion, Body and Garment, both from the School of the Art Institute of Chicago (SAIC), and her MFA in Fiber from Cranbrook Academy of Art. Medina views her textile production as a process of decolonization through whichshe grapples with identity, ancestral trauma, and the fixed and fluid spaces of the body. 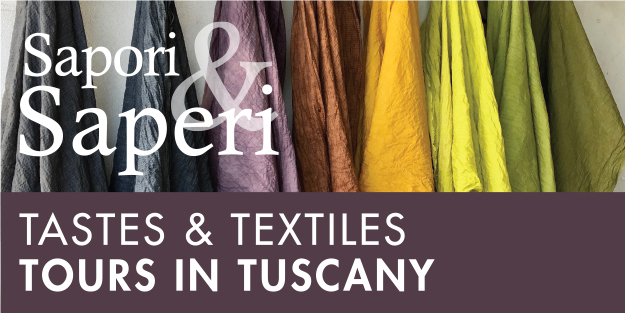 Medina is currently a visiting assistant professor in Fibers at Oregon College of Art & Craft.